You probably spend a lot of your time in your kitchen; whether you’re cooking, eating, or gathering with loved ones, it truly is the center of your home. As such, you want your space to be inviting, functional, and aesthetically pleasing. If you’ve been thinking about updating your kitchen, you have two options: renovate or upgrade. Understanding what’s involved with both options can help you make a better decision. A complete renovation involves planning, resources, a large budget, and time. If you’d like to gut out the space, take down walls, move plumbing, and add windows, you’ll need to hire a professional contractor and kitchen designer. You will need to take the time to pick out the cabinets, fixtures, lighting, flooring, and more. You will also need to plan for functioning without a kitchen for a while, as you won’t be able to continue to use it during the renovation. Depending on your needs, renovation may be a worthwhile investment, especially if you’re planning to be in your home for the next 10 years or more. If you have the financial resources and the time to renovate, it will certainly add value to your home. Whether you choose to renovate or upgrade, a refreshed space is sure to bring joy to your home. Take some time to review the pros and cons to both so you can make an informed decision. If you’re planning to move anytime soon, or you just don’t have the budget for a complete overhaul, consider doing some cosmetic upgrades instead. By upgrading your kitchen, you can enjoy the benefits of a new kitchen without the headache and hefty price tag. First, take stock of what is currently working for you and what is not. For example, homeowners can sometimes feel the burden of using dysfunctional cabinetry three or four times a day. 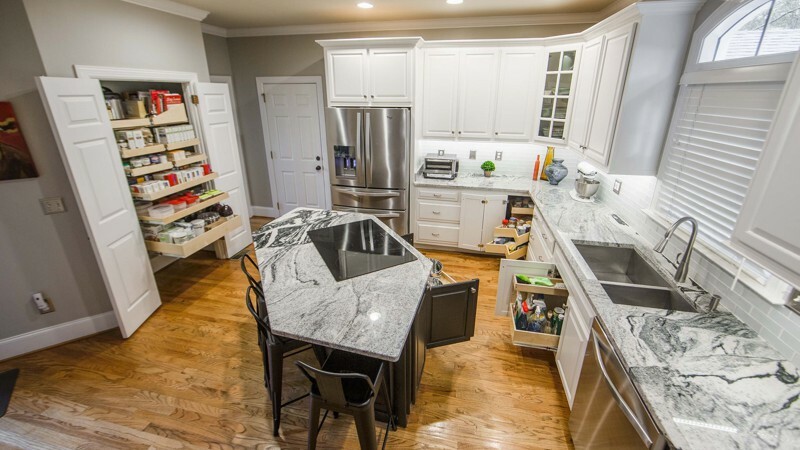 Is the lack of access to or poor functionality of your cabinetry a growing frustration for you? If you are spending the money to update the look, make sure you are also updating the functionality of the space. With ease of use being a huge priority for kitchens, simple solutions like pull-out shelving for your pots and pans or under the sink for your cleaning supplies can make a big impact on the functionality of your space. 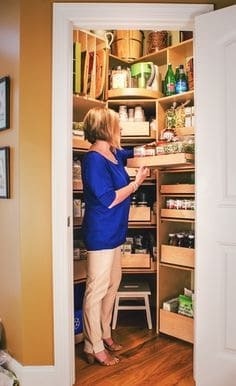 For a clean and streamlined look, consider installing pull-out shelving in your cabinets and pantry. Easy access to everyday items is essential in every working kitchen. Pull-out shelving will provide you with both a modern look and more storage space. Determine what small changes will make your space better. The benefit to upgrading is you can do a little at a time, as your budget allows and you can also continue to use your space as you upgrade. Get a free design consultation from Richmond’s’ ShelfGenie. We’ll come to your home to get to know your unique needs and design tastes. You’ll get a custom designed solution on the spot, with no obligation. Your project will be expertly crafted from measurement through construction. Custom-made for you.